Friday, 10th June, saw yet another successful Heesen/Nakhimov collaboration launch, when the new 37 metre motor yacht Aurelia took to the water for the first time. Her owner, for whom this is his first boat, christened her properly with a well-aimed bottle of the finest ‘launching liquid’, following brief speeches by Fabio Emeretto, Sales and Marketing Director for Heesen, Sergei Dobroserdov for Nakhimov and the owner himself. While the standard layout for Heesen’s ‘37’ is a 5 cabin configuration, the owner wanted more comfort for guests and more space for the crew, so designated a guest cabin for the captain. The result is a more realistic 6 crew for 8 guests and everyone benefits from extra living space, plus a welcome and essential increase in laundry facilities. A further aid to comfort, especially when at anchor, is a pair of gyro stabilisers although these are also incredibly efficient under all conditions. 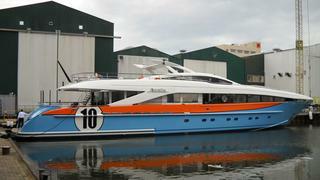 The launching party went off in typically lavish Heesen style, with eight pretty model girls and a couple of full-race cars in correct Gulf Racing livery, plus plenty to eat and drink for the entire work force. Captain and wife team Brendan and Barbara Scott, plus a long-time associated engineer and top class chef, will be taking care of owner and guests and the yacht is expected in the Med in early August. Aurelia is scheduled to charter on both sides of the Atlantic at €125,000 per week, under the management of Nakhimov Yachts.